It’s hard to NOT come to the conclusion that nearly all longboard surfers these days are just dressing up in the same old, tired costume. Their boards are so generic, so retro, so focused on cosmetics, so unimaginative, so truly NOT custom. Not that they realize this of course. What the average Joe is riding is so disheartening. In many ways it’s only hurting them, but at least they don’t know it, proof that God is kind. An insightful friend pointed out to me that most surfers today have some sort of ‘X’ length formula burned into their brain. It states something to the effect that they feel ‘OK’ about riding a 9-0 at age 35. It’s safe, not too prone to ridicule…All based on what the ‘culture’ tells them is OK. At age 40, they compensate upwards to a 9-6, and continue upward. Just add 4” for every birthday over 40. This is the most basic situation in the ever-aging surfing population. And even with that being the case, do you EVER see anything different for this huge mass of surfers? Never. What is culturally acceptable, not personally interesting, is what determines personal board choice. If you step outside this culturally accepted ‘norm’, watch out. What? A guy with something different? Take your average aging surfer, liking longer boards but not really having the skills to ride like David N. on the nose. I fall into that category. I love the glide and trim of longer boards, but I’ve never hung ten, rarely five. How about you? Anyone else want to raise their hand? There are few forward thinkers in the surfing world, maybe even less so in the ranks of your common shaper. Unimaginative shapers, all replicating someone else’s tired ideas from 10-30 years ago. If left to the shapers out there, your average 45 year old will be riding the same board in 2045 as he is today. If the surf culture en masse started experimenting, the average guy’s surfing would improve. So too, would shapers be forced to begin a sort of design quest, and you might have 500 shapers making improvements and contributions. Read any sailing magazine and realize how skilled and educated even your basic boat designer is, and the difference between him and a surfboard shaper is almost cosmic in the distance between the two. Look at all the truly innovative boat hulls coming out, and witness an industry that is truly led by change, and willing to move forward and try new things. There’s little that’s even close in the surfing industry. There is the shapes themselves are about as refined as they’re ever going to get. For me, over the years, after experiencing that feeling of ‘the glide’, I fell in love with it. The sensation of being so in trim, not outrunning, not falling behind the wave. Just locked in to the waves speed. Where I surf, we have a lot of beach breaks. When the seasons change from summer to fall we get a lot of swell. Combine that with some stiff offshore winds, and you have excellent conditions. One of the drawbacks to those conditions is the expanded playing field. Paddling power is paramount to getting good waves, with shifting peaks up and down, inshore and out. Shortboarders sit inside, duckdive and get quick rides. That’s fine if you like to duckdive and get quick rides. 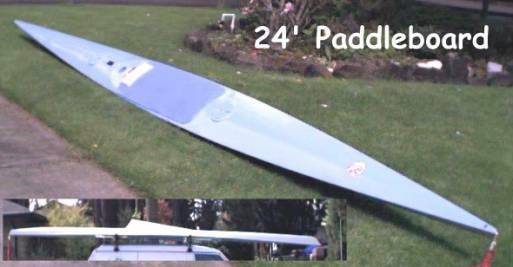 With a more powerful paddling board, I have the vehicle in which to sit 50 –75 yards outside and get in the waves way early. I’m able to catch a cresting unbroken wave, drop in, set a line and speed, high and tight through where the shortboarders are and fly way further down the line, due to the speed achieved from a longer set up area. Ride fast and kick out and use the paddling advantage again to get back outside before the next waves catch you inside. The key is paddling speed. How can you ride one and NOT see the benefits of it all? The “average” longboard has just too much width in the nose and middle. On waves with some juice, that width just gets in the way…If you’re not gonna really ride the nose, why have that width. It just doesn’t fit the waves as well as something more streamlined. The board I’m riding I shaped a few years ago. It sat mostly unridden for a long time. But I broke it out early this summer for some very clean, empty point waves in this region. That session has hooked me on the undeniable quality of the ride these boards offer. The more I ride it, the more it makes sense. I’m not talking about 17’ boards or anything in that range…Human scale here. What’s got me so stoked is a 12’ Surf/ Paddleboard. I envisioned a board that had the qualities of both genres, without compromising the better aspects of each. A tough balance, but do-able. Out of a custom cut Clark 12'3", I templated a narrow, fairly parallel outline. Maximum width 20”. The maximum thickness is 3.75”. I shaped a typical paddle board entry, rolled vee for the first two feet or so, running to a gentle belly roll for a few more feet (we are talking lots of board) and ending in a harder edged pulled in round tail, with a flat vee panel running up about three feet from the tail. Single fin box, thank you. The key to combining the best of both aspects of paddle / surf, is having a generously domed deck to carry the thickness, and a bottom with moderate belly that rolls out to a rail that’ll still wrap water and hold in. A full length chine can add some more bite if you need that. The rolled bottom and the large flat vee panel keep it loose rail to rail. The boards length precludes most sudden direction changes, but the early entry, and the speed available through that, allow plenty of set up time for what’s ahead. With practice some mind bending right go left ( and visa/versa) takeoffs are achievable and repeatable. It is a great riding board, it can get around falling sections and of course has a lot of drive (what would you expect from 12’ of rail). Besides, you can catch a ripple with it. Finally, because of their stubbornness to expand their minds, other surfers might look at my board and laugh, think I’m a wannabe big wave hero, and misunderstand the principles behind the design choice. Yet at the end of the day my wave count is almost always higher. And I guarantee that I’m the one smiling when I leave the water. You can argue it is all fun, and it all works, but it is a lot more fun when you catch more waves and at this age that is all I really want to do. Some might figure that I ‘went big’ to compensate for my age, when in fact that has never figured into my formula. My fitness level is well above average for my years. I’ve got witnesses.My inherent surfing skills are about as refined as they are ever going to be (realistically, I've passed the peak of my inherent refined surfing skills, and at this point of my life it’s mostly refinement). As has been said before "If you can't out surf ‘em, out think ‘em." CAUTION: Anyone with such a powerful wave catcher MUST NOT over use such an effective tool in even moderately crowded conditions. It’s just not cool to be a wave hog. Instead, smile, encourage and share. Description: The deck / bottom is cedar/basswood. Rails are laminated cork/bending plywood. Carbon Fiber reinforced stringer. 4-oz.E-glass laminated on inside of deck / bottom. Exterior Glass: Resin Research Epoxy /4-oz.E-glass. The fin is flex fiberglass-removable. Built to ride. 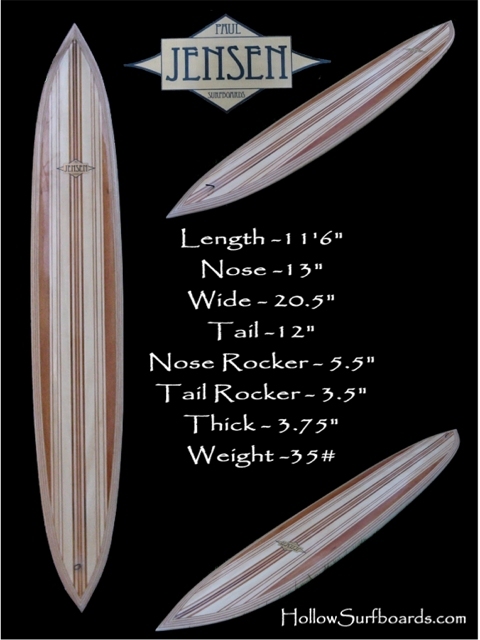 This design is primarily a surfboard that paddles really good, catches and rides waves in a specific sort of way. Not for everyone, sure, but for those who ride this style of board, who've experienced the joy of the "early in", the superb trim lines available, and the incredible distance you can go on these things, it makes us wonder why more choose to not ride one. I start out with the planshape. Pretty similar to creating a template for a foam board. Albeit harder with an 11' length and only 20" wide. Next, in conjunction with the planshape template, I create the rocker pattern...That's a bit harder to layout, especially the deckline. But you can really visualize the board by making your own stringers. Finally, the cross rib patterns are created in conjunction with the stringer. I can adjust the deck crown, the tail vee and nose belly at this point. Building the framework this way, becomes a matter of "seeing" boards differently. Section cuts. In some ways it's easier than foam. With precise templates, I know what I'm getting, as opposed to looking at a very white blank that can really only be "seen" with special sidelights. 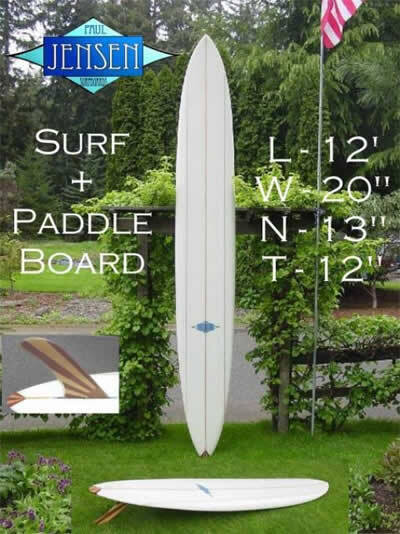 Description: This paddleboard came to me via a friend who had it outside his heavily wooded home on Puget Sound. A couple of years ago, large tree branches fell on it and busted it up in a handful of places. Originally it was a ’Maas 24’, an open water single seat rowing shell, the type that held the record for the Catalina Rowing Race. It is hollow, of carbon fiber re-enforced, syntactic foam core fiberglass. The length is 24'. Its maximum width is 20". Originally the hull depth was 10" at mid-point, the bottom fully rounded. The deck originally had a rowing set up. I cut out the rowing hardware and seat cockpit, and glassed on a piece if 1/8" mahogany plywood. I added 2-6" access ports for storage, glassed in a water bottle holder, and added some tie-downs on the deck and a Velcro mount for my CD player. After repairing and repainting the deck I put on a 1/2" thick belly pad with a 1" thick chest pad. The chest pad reduces neck strain, helps to use the back muscles more efficiently and improves paddling position. The original bottom configuration was extremely unstable. Despite its length, a converted rowing shell presented great difficulty even laying on it. With a fully rounded bottom it was like trying to lay on a 24' fiberglass half barrel. The only way I could paddle and stay on, was to have both legs drag in the water. It was less than graceful. To compensate for it's tendency to roll on axis, I added a wedge shaped keel that is 1/4inch thick by 5 feet long and 7 inches deep. This was glassed on at the hull mid-point. This configuration worked well but the shell was still difficult to knee paddle, so I again modified the bottom. The most recent modification was to reduce the bottom depth from 10" and rounded to 6" and flat. The keel remained. This set-up is so good! I feel my paddling speed is limited not by my strength, but by my hand recovery speed. The shell is so efficient though the water that the pull of the hands in the water is swift and the glide is long and smooth. Never does the shell feel as if it is pushing water. The disadvantages to the 24' length are few. There is a susceptibility to side winds due to more hull available to the wind. The other hassle is moving the thing around. Not because of weight (about 30#). However you need to be aware of where the ends of the board are when you are moving it around. These few drawbacks are small when compared to the speed and efficiency of a drawn out, streamlined hull.